Gorgeous 3 Bdrm at Water's Edge With Amazing View! Walk Everywhere! Escape on a getaway to historic Charleston! Stay at our comfortable, well-appointed, and beautifully decorated town home on Folly and enjoy the best of both worlds - the relaxed beach atmosphere of Folly and the charm and culture of Charleston. Our town home is at Waters Edge, a charming development of colorful Charleston-style homes on Folly Beach. We are located in a quiet, tucked-away area on the river, but just a few short blocks to the beach and fun town of Folly. This is a beautiful, clean, no-smoking villa with one of the best locations on Folly. 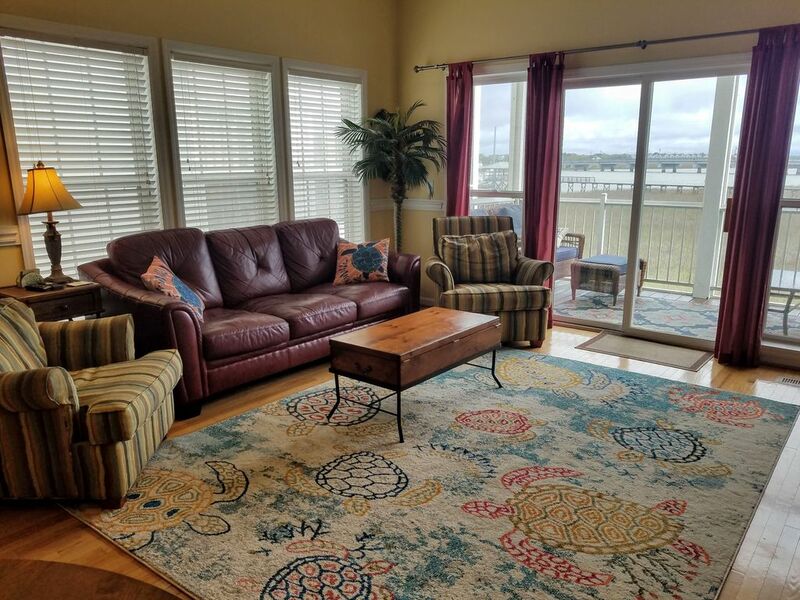 Enjoy amazing views of the Folly River and marsh on comfortable lounge chairs from the screened-in porch and from the second-floor master balcony. Great restaurants and beach is an easy walk through quiet, tree-lined streets. The homes sleeps 9 comfortably. Twin over double in first floor bedroom with full bath. Queen with full bath on second floor. Master suite with king and full bath on second floor. New sleeper sofa in family room with comfortable memory foam mattress. Family friendly for babies: pack and play, booster seat, radio flyer provided. 50-inch LED Smart Samsung TV with HD in living area; flat-screen TVs in king and in queen bedrooms. We have endeavored to make our home a stand-out, and offer many extras including beach bikes, beach chairs, toys, games, charcoal grill, and outdoor shower to wash away sand from a day at the beach. Washer and dryer and ironing board/iron is in laundry area on second floor. We also provide guests with a unique online rental guidebook (easily accessible on phone/tablet/computer) that takes the stress out of trip planning! Ever travel to a destination and then wonder how to make the best use of your time and money? Don't stress about what activities to choose or what restaurants to visit. Whether it's a fishing trip or our favorite hole in the wall for mouth-watering fish tacos - we offer tips for the best places to go on your vacation. Spend the afternoon by the river-front pool while watching boats drift by, or fish off the community pier where spectacular sunsets are almost guaranteed. Explore the eclectic town of Folly Beach, which boasts surf shops, great breakfast spots, seafood restaurants, and wine and beach bars. Stroll the 1,000-foot fishing pier or take a leisurely bike ride on the island (several beach bikes are provided and bike rentals are nearby). Charleston, with all its culture and charm, is an easy 15-minute drive away. Activities: (on site or nearby): Biking, Golf, Tennis, Fishing, Wildlife Viewing, Hiking, Shopping, Restaurants, Cinemas, Museums, Sightseeing, Swimming, Snorkeling/Diving, Paddleboarding, Boating, Sailing, Surfing, Windsurfing, Jet Skiing, Shelling. We are a family of five, and we have been sharing our homes with guests since 2003. We manage four properties - three in the Florida Panhandle and one in Folly Beach (our favorite). In 2003 our neighbors told us of a marsh-front property they purchased on Folly Beach that boasted beautiful views. We were intrigued and the next week we drove down to see it, and we were hooked on Folly! The town homes at Water's Edge are classic Charlestonian homes on the Folly River. When we stay, we love that we can walk to town, shops, the pier, restaurants, as well as ride our bikes all over the island. Folly is a unique beach town that draws people from all walks of life. Our great location enables you to enjoy all Folly has to offer. You can go paddle boarding/kayaking; deep sea fishing; biking; shark tooth hunting (you might even find a Megladon! ); beach combing; surfing. Stop by the Folly Farmer's Market, eat breakfast at the Lost Dog, listen to live music at one of the many establishments ... and if you want a change of scene, be sure to drive into Charleston, which is only 15 minutes from our home, where there are great restaurants, wonderful tours, and friendly people. Folly Beach has six miles of beach. It is only a 5-10 minute (3-4 blocks) walk to the beach. You can walk to all the shops, restaurants, and bars nearby. Center Street is 0.2 miles away. We are located on the Folly River. Our town home is on the Folly River. Beautiful views of Folly River, boat landing, and Morris Island Lighthouse in the distance. Located on the Folly River. Linens provided; they are folded and left on dressers. Fits two cars. Guests must park in garage at all times and not in front of garage. Bath towels provided. Please bring your own beach towels. Comfortable leather sofa and two arm chairs. Additional seating on dining chairs. Spice rack. One roll of paper towels and one roll of toilet paper per bathroom is left for guests upon check-in. Dishes and utensils for 9 guests. Dining table seats up to 6. There are two barstools at counter. Living area and king and queen bedrooms have flat-screen TVs. Living room has a 50-inch LED Smart Samsung TV with HD. Board games (Scrabble, Monopoly, etc) and cards available. Pool and beach toys in garage include sand pails, shovels, nets. Beach wagon and cart to carry beach items. Water's Edge has a dock where you can launch a kayak or paddle board. There are kayaks and boards for rent on the island. We have 4-6 beach bikes. Helmets available. Additional beach bike rentals within walking distance. Our charcoal grill and outdoor shower are located on the patio. There are usually some boogie boards for use in the garage. If not, you can buy them at most stores on the island (within walking distance). Folly Beach has a tennis and basketball court located about 3/4 miles away from us. We are five homes away from the riverside pool for easy access. Pool is open April through October. Pool is not heated. Pack and Play, Two Booster Seats, Baby Gate, Radio Flyer, beach cart. Small playground on site; two larger playgrounds located .5 miles and 1 mile from town home. We spent the weekend at Folly with my parents (visiting from MA) and our children and this townhouse was perfect! Beautiful view of the marsh, plenty of space and so convenient to the beach. Children specific amenities (wagon, pack n play, beach toys, etc.) were a huge perk! We truly enjoyed our stay at Waters Edge. The condo was well-equipped and a great size for two couples (or more). The location was perfect for a vacation that was a combination city and regional tour of Charleston along with plenty of easy and relaxing beach time. We had a great weekend at Folly Beach! The townhouse was very clean and comfortable for our family. We loved sitting out on the patio and enjoying the view. We also loved that we could walk to the beach, shops and restaurants. Would definitely recommend! Thank you, Kim, it was a pleasure to host your family. We hope you will visit again! We stayed at the Waters Edge for 5+ days for the NYE celebrations. What a great place and great location. Anyone that knows Folly Beach and the Charleston area knows that the balance between location and accommodations can be tricky. Absolutely no issues here. We could walk everywhere, if desired, and could drive easily when needed. We were also able to use the provided bikes to explore both ends of Folly: Lighthouse to the County Park. Great times. The rooms and other accommodations were exactly as described. Both the screened porches were nice ways to start and end the day. Everything in the kitchen was in working order as was the bathrooms, bedrooms, etc. Wouldn't hesitate to book again and probably will. It was great to have you and your wife stay - glad you enjoyed the bikes, location, and festivities! We would love for you to come back again! Thank you for such a nice review! Lovely home. Clean, neat, beautiful view. We thoroughly enjoyed our stay. Folly Beach and nearby Charleston offered many opportunities for exploration, shopping and dining. The pier and pool areas are nice for relaxing outdoors. Please note that the condo has very steep entry stairs, as well as another set to access the upstairs bedrooms. For anyone with mobility issues, it is difficult to carry luggage, coolers, etc., inside. Also, it is advisable to bring hand and bath soap, as well as dishwashing liquid (although product is there for the dishwasher). It is necessary to bring extra TP and paper towels, as well. We're so pleased you chose our town home for your girl's get-together and happy that you had fun exploring Folly and Charleston! Our cleaners are instructed to leave out hand soap in each bathroom for guests, as well as toilet paper and paper towels. We would love to have you stay again! We are an easy 15-minute drive to Charleston and a short 3 to 4-block walk through quiet, tree-lined streets to miles of beautiful public beach. Other islands nearby to visit include Edisto Beach, Kiawah, Sullivan's Island, and Isle of Palms. You'll find a different flavor at each one! Note: Until confirmed, rates are subject to change without notice. We rent to 25 and older only, no student groups. No smoking, pets, parties, events.